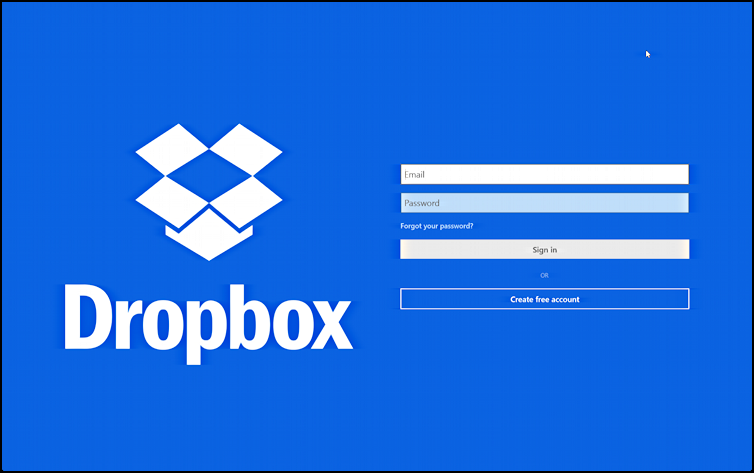 Get started with Dropbox on Windows 8? I’m running Windows 8.1 and need to hook up DropBox so I can access some files my boss wants to share. Can you help me out? I’m a big fan of Dropbox, actually, and use it to share photos and documents throughout my online world, whether it’s an Android tablet, an iPhone running iOS 7, a Mac OS X system or a Windows computer. One folder, magically synchronized across all the different platforms. What’s not to love? What? You’re not on Dropbox yet? I suggest you check it out: Join Dropbox, share data across every platform. Dropbox works really well. 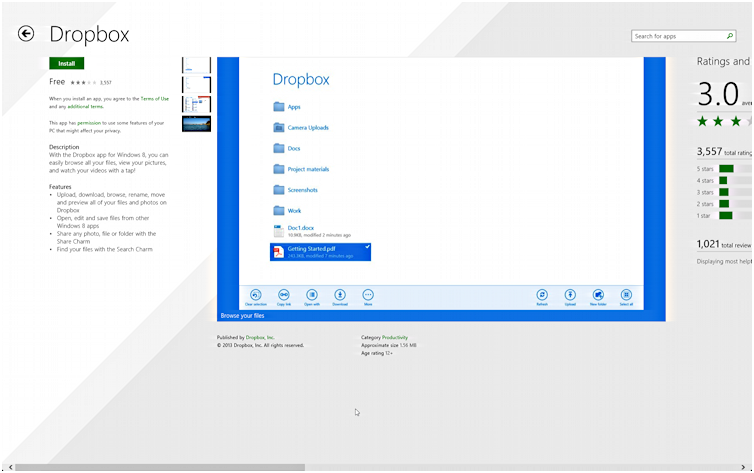 But Dropbox on Windows 8? It’s either not a priority for the company to implement, or they just don’t have as talented a team of developers as with the splendid Mac version. I’ll explain as we go, but don’t be surprised if it feels rather half-baked. Not such great ratings when it’s 3 stars out of 5. One way to think about that is that for every person who gives it a four or five star rating someone else gave it zero or 1. Still, closer examination of the ratings shows that a lot of the lower ones are from previous versions of the Dropbox app, and there is the standard “where are the menus in Metro apps?” problem too, as I’ll show in a minute. Still, the boss is waiting, so click “Install”. After a short period of time it’ll be downloaded and installed. Leading to the next standard Win8 question: where is it? Ah, there it is! Sweet! Right-click on it and you can “pin to start” so it’s more easily found next time. Or just launch the app! Yes, that’s one BIG login page. Ah, the fun of Windows 8.1! Most of the comments people leave in the app store, btw, seem to be because they don’t know how to get to those four buttons. Now you do. Go team! That’s it. Click on a file to open it, or drag it to your Desktop, or right-click on it to see the options. Done. Now, good luck with your work! Regarding Dropbox and Windows 8, it’s worth also saying that I don’t use the store at all. I just work straight from my desktop (I installed Start 8 before 8.1 came out!) and use Drop box just the same as I did with Windows 7. Dropbox is an excellent product, but the company has now brought on a director with a track record of civil and human rights violations and lots of doublespeak. Can they be trusted with our private information? They say they can, but actions speak louder than words. In the age of cloud computing, trust is critical, specially when competing with other major players such as Google, Microsoft and Apple. Depends on how much you believe that a member of the Board of Directors is going to really influence the direction of the company. From my business experience, a well-known director is in title only and barely pays attention to the company at all. It’s just for publicity.